The Altar Server is a male or female member of the assembly who assists the priest and deacon during the Eucharist and other liturgical ceremonies so the liturgy can be conducted with grace and reverence. Altar Servers should be active and full participants in the celebration with the understanding that they are leaders of the assembly. The altar server models the activity of the assembly and by singing, praying and keeping silence can enhance the worship of the assembly. To serve at St. Joseph you must be at least entering into the 5th grade and complete formal training. Please be sure to arrive at least 15 minutes before Mass and sign in. If you are subbing for someone, write your name on that person’s line and write “sub” after your name. are to wear a shirt with a collar, dress or school shoes, and pants. Shorts are permitted during the summer if they are dress/casual. NO FLIP FLOPS please. Select an alb that fits you best. Please check the calendar on the bulletin board in the server’s sacristy for the liturgical color for the Mass. If you are serving Saturday - look at Sunday. Then pull the matching cincture(rope) on the wall (green, purple, red, white). 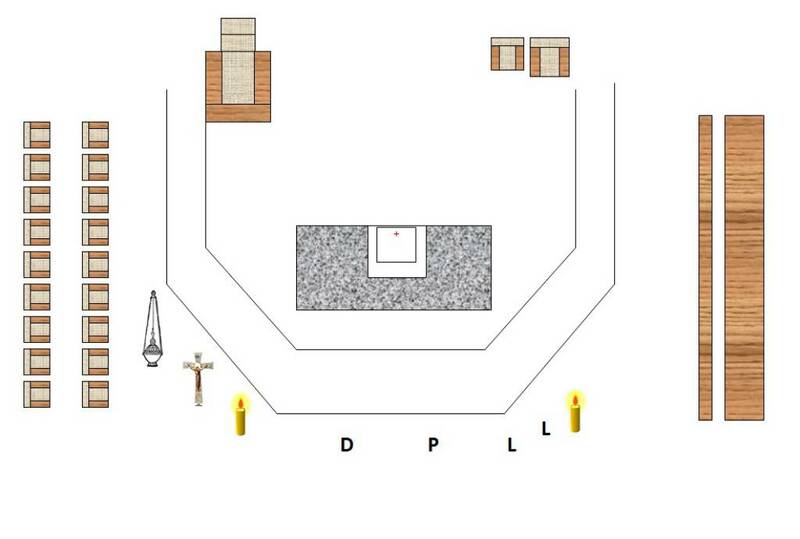 After you have found your alb and cincture, the Altar Candles need to be lit. Head down the main isle, reverence the Altar (bow). Any time that we cross over the Altar or approach the Altar we bow. In the work Sacristy you will find the brass tapers hanging on the wall. Light one and use this to light the Altar Candles and the four candles by the crucifix if they are not already lit. The procession to the Altar will be in the following order: Thurible (if used), Cross Bearer, Attendants (other 2 servers), Lector(s), Deacon, Priest. When everyone reaches the steps to the Altar, everyone closely forms a line in front and bows together. After the opening song, the priest will say “let us pray.” One of the servers should bring the Roman Missal to the Priest, bowing as you cross over the Altar. During the Mass, Altar Servers should respond aloud to the prayers and open the hymnal and sing the songs unless they are assisting the Priest and Deacon. Remember to be an example to everyone. At the beginning of the Offertory, the Altar servers, working together will place the chalice(s) on the tray on the credence table, and Roman Missal on the Altar. Then one server will walk with the Priest and Deacon to receive the gifts. After this, servers will get the water, lavabo(hand bowl), and towel from the credence table and return to the Priest to wash his hands. Return everything to the credence table. After the “Holy, Holy, Holy” the entire assembly will kneel, including the Altar Servers. Altar Servers kneel in their pew and stand just as the rest of the assembly does. We are actively participating in the Mass. While the Priest, Deacon and Extraordinary Ministers of Holy Communion are distributing the Eucharist, the Altar Servers will remove the Roman Missal and tray (on weekends) from the Altar and take them to the credence table. After Communion, the Priest again will say “let us pray.” Again, one of the servers should bring the Roman Missal to the Priest, bowing as you cross over the Altar. When the Closing Hymn begins, wait for the Priest and Deacon to reverence the altar. Immediately leave the pew to form the recession to leave Mass. Line up in the same oder as the Entrance Procession. Bow in unison the smoothly turn and process to the rear of the church.